Did you make cheonggukjang (extra-fermented soybean paste:청국장) with the recipe I showed you last time? If you don’t have time to make cheonggukjang you can probably find it at any large Korean grocery store, although the packaging is often confusing. Some product labels just call it “soybean paste” and some call it “natto,” which is a Japanese word. You may need to memorize the Korean word “청국장” and find it on the package. Anyway homemade cheonggukjang tastes much better than store bought, especially when you make it with organic soybeans. Then let’s make this irresistible stew with it today! Yes, it tastes irresistible and smells irresistible! 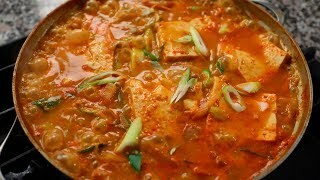 When cheonggukjang-jjigae is bubbling on my stove and giving off its unique, delicious aroma, my mouth starts to water! Once you have cheonggukjang it’s so easy and simple to make this stew, you just need water and some well-fermented, sour kimchi. This stew always reminds me of my cousin in Korea. She had 3 teenage children and they had huge appetites, so every meal she prepared was massive. One winter day, I stopped by her house. She was making cheonggukjang-jjigae for lunch in a huge pot. We had it with rice and a few more side dishes. It was the best cheonggukjang-jjigae I had ever tasted! Her children loved it, and I can still picture them eating it heartily, with sweat dripping from their faces from the steamy stew. I make a lot of cheonggukjang and keep it in the freezer all winter, so I can quickly and easily make this stew or soup any time. Cheonggukjang has a lot of good health benefits but many people, even Koreans, think its smell is too strong! I read that some people invented cheonggukjang with no smell! Are they serious? I can’t imagine how no-smell cheonggukjang could be delicious! The stew’s taste comes from its flavor but also from its texture and smell! 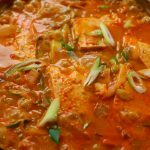 Enjoy the recipe and let me know how your cheonggukjang-jjigae turns out! Place zucchini, onion, and garlic in a shallow pot. Put the anchovies into a soup pouch (or soup strainer) and add them, too. Add kimchi and kimchi brine (if used) and 4½ cups water. Cover and cook for 20 minutes over medium high heat. If it boils over, crack the lid. Add fish sauce (or salt) and stir well with a spoon. Add the cheonggukjang and break it up with a spoon in the stew. Add tofu and sliced daepa. Keep some daepa behind to use as a garnish later. Cook for another 5 to 10 minutes until the tofu is soft and the broth is a little thick. Remove the anchovy pouch. Garnish with the last of the daepa and serve right away with rice. Posted on Friday, January 18th, 2019 at 12:21 pm. Posted February 5th, 2019 at 12:10 pm | Log in to reply. That was so yummy! Full of umami. I’ve cooked it with store-bought cheongukjang, but anyway. :) Thanks again Maangchi, the world can not be enough grateful for you. This recipe was originally posted on January 18, 2019 at 12:21 pm by Maangchi. The video was watched 233,724 times on YouTube & has 8,211 likes!